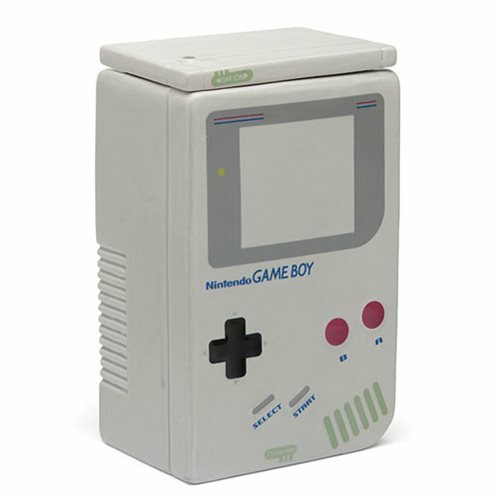 The Game Boy has turned into a coffee canister! Yup, the Nintendo Game Boy Coffee Canister from Think Geek lets you indulge in both your favorite addictions - coffee and retro gaming. This 9 1/10-inch tall x 5 1/2-inch wide x 4 3/10-inch long ceramic shrine to your childhood holds up to 2 liters (about 2 1/10 quarts) of beans or grounds or whatever, and it can be also used as a cookie jar. (You know, that other thing our parents limited our access to.) Rupees, container hearts, and 1-Up mushrooms not included. Ages 14 and up. The Game Boy. Our parents said it was addictive. They said too much of it wasn't good for us. They said playing it would take the place of, you know, good things. Things that would be healthy for us. Things that would nourish us internally, and help us grow to our full potential. But we kept telling our parents, "We can't live without it!" Hand wash only. Not dishwasher safe. Do not microwave. Ages 14 and up.